Still lots of work , but I think that this IC will equal or beat it. I just found a better version of the AIYIMA TPA3255. 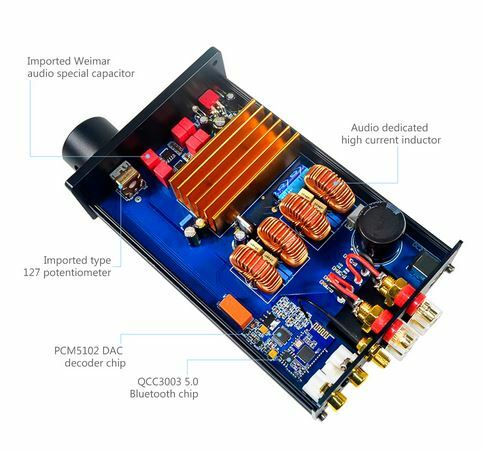 It has PCM5102 and QCC3003 and look like to have better cap. Last edited by hansueli; 25th March 2019 at 12:25 PM. if you buy and start modding it would be nice to have a seperat thread. I am looking first to build my Iraudamp7 with 500W LLC power supply. It is not easy to get low Esr caps 63v/1800 in the middle of nowhere I am living now. There are some caps available in local shops but seller s have no idea about low esr/ impendance of capacitor s they sell just voltage and capacity with no data about esr. Thus no progress for now. Booking via internet and waiting think no worth efforts. Will try another board described here with elna big caps. According to the QC300X datasheet, the QC3003 does not implement APT-X, so only SBC/AAC/MP3 link is available. Btw. QC3003 is "same" as CSRA63210. Hi, everyone. There was a consider here that my super psu 1200w can limit the current and it might be the reason of limiting my tpa3255. Actually iwas very sure that psu with 50v/1200w should deliver big reserve in power supply . To define it I connected tpa3255 to HP notebook adapter 19,8V/90 W and found some improvement in sound increase. The tpa3255 couldnt start both channels from the first attempt, i connected one wire channel then second. Guess some other kind of protection prevented it to start with low voltage. Anyway it started and wow it sounded very nice endeed even with 19,8 V. So, now need to eliminate my psu current limiter. Think just add capacitors between psu and tpa3255 , think 10000 mkF would be enough to see the progress. What do you think, mates? fine that you find the reason of limiting the current. but no the laptop bricks are build to be cheap and deliver "constant" current into the load, more or less its a slow regulation circuit. so an additionally cap doesn't help here in the final solution. the class D amp must have a good, very good regulated smps with the correct "designed" power what you need and calculate. therefore a big fat cap bank, e.g. 1000000µF is not needed, because the smps regulation circuit is not able to regulate this "request" correctly -- voltage overshoot!!! BTW...its not 10000mF...its 10000µF...a big difference!